What do you say about one of the masterminds behind one of the most influential, innovative bands ever? Even if you haven't actually heard of Can (how unhip can you get? ), you know their music, at least through others unless you live on steady diet of Kenny G. and Michael Bolton: for some good background on the band, check out Paul Dickow's article. If this was Holger's only achievement, he would be a legend but luckily he has persevered after the break up of Can in the late '70's. Collobartions with Jah Wobble, the Edge, David Sylvian, Brian Eno and others as well as his own solo work have been keeping him busy. I had a chance to speak with him on the eve of his first U.S. tour, that he's taken along with chanteuse U-She and DJ Dr. Walker, about the past, present and future. Former Can singer Malcolm Mooney was at the New York concert (at THE KNITTING FACTORY) but declined to join the show. I'll tell you something: hearing Holger sing 'My Way' was a lot more surprising than hearing it come out of Sid Vicious' mouth. It was even funnier than his stories of David Niven being one of Damo's first fans, intergalactic plumbing (George Clinton would be proud) and almost ending the Cold War with a couple of beers (ditto Bill Clinton). UPDATE: Holger Czukay died in September 2017. Please see my tribute to him in The Wire magazine, which includes some details about our later encounters and some wild, prank-filled stories from throughout his life. HOW DID YOU MEET UP WITH DR. WALKER? I was introduced through an electronics dealer who gave me his address. I met up with him and I knew something about his music. U-She made this connection also- she knew that this was the most exciting music scene anywhere. He lives in my neighborhood, about five minutes walking distance away. We started to have a spontaneous session in a multi-room party and that turned out very well. Then slowly we started to make another session at Liquid Sky in Cologne and we recorded it. It was an excellent recording, last summer. I editted that for a live CD (coming later this year). We thought that it was wonderful to go on with that. YOU'VE DONE A LOT OF WORK WITH 'FOUND SOUNDS' OVER THE YEARS. This is what I've usually done all the time. What is interesting is now is the fact that we can or cannot perform something like that live and we don't know what can we expect from such an event. For me, this is the most important question. It is interesting that he is somebody who understands me very well and he is able to react on that. We found out that this works out very well. It's become sort of a dance-techno or techno event. It's something which reminds me of the very first Can concerts. The concert yesterday that special quality and this is something completely different for a media. If you want to make a recording for an album or CD, this is a completely different way of working. This live performance is something different. It's changing all the time when we do the shows. HOW DO YOU COMPOSE YOUR WORK? WHERE DO YOUR IDEAS COME FROM? Just by logic. First of all, you must have a vision, even with the roughest idea where this could lead to. This is the way that I usually work. Others can't feel that and they may not understand the way I work. WHAT KIND OF INSTRUMENTS ARE YOU USING FOR YOUR SHOWS? It is a very small keyboard that I use actually. You can use special samples with it. Usually samples are very short moments. But these are longer moments. With these, I can make it possible that the music, and this is usually the best quality live, is playing itself. You are in the position of conducting. If this happens, you are lucky. This happened in Can as well. In performances, you try to enforce the music, then you have a brave character to do that but actually you are not that lucky. JAKI (LIEBEZEIT) AND MICHAEL (KAROLI, BOTH FROM CAN) APPEAR ON YOUR 'MOVING PICTURES' CD. YOU'RE STILL CLOSE WITH THEM? This was recorded three years ago. From time to time, I see Jaki- he's a great drummer. He doesn't live far from me. Michael I see less of because he lives in South France. Irmin (Schmidt) is very involved in his own music. Television music and writing operas. His wife is my manager so we're still in close contact. ON YOUR OWN AND WITH CAN, YOU'VE DONE A LOT OF SOUNDTRACK MUSIC. DO YOU TRY TO 'VISUALIZE' A LOT OF THE MUSIC THAT YOU MAKE? Very strongly. Actually I'm not thinking visually. It happens that the music comes to me. This is one of the reasons why 'Moving Pictures' is based 'non-existant pictures.' To make film music, for me, is that film is getting shot and then at the end they say 'aha, everything's finshed, let's get the film music.' Then they look for a composer and he looks at the film. This is the biggest mistake of all. I had a meeting with Ennio Morricone, talking about this. I also made a lot of film music with Can- we could have lived off of that. We were so lucky that Irmin was connected with theater and film. He talked to the director, he checked out the film, he went to the studio and told us the scenes but there is a difference if someone is telling you a scene or you are seeing it on a screen. When somebody tells me a story, your fantasy is so unlimited because you're not limited from what you see on a screen. With Can, the film music really became somehow extraordinary I must say. This is what Morricone said, that he was so lucky that he was a good friend with (director) Sergio Leone. Leone told him what his intention was and Morricone gave him an idea musically. In the beginning of the shooting, the music was somehow sketched. Then they started shooting. This is a very good way to do that. It doesn't have a strong seperation between the shooting and the music then. I was once involved in a video musical. I played the main role. It was for television. The way that it was produced was that I was working the light and the music and the cutting of the scenes were done all together. Cutting and performing the scenes was done exactly at the same time. It was at different studios but when the picture came out and I saw what I was doing, then the picture was re-edited again. Watch out for a film director who thinks this is a good idea! This is one of the reasons why I made 'Moving Pictures.' It has something to do with images and pictures. Maybe someone has made a film and he knows something about this music and it would fit perfectly. Then this is the best way to rely on music for the film and not the other way around. I had working with radio also. I have something to do where I am trying to create an outside world. What has the man in the radio to do with me? He doesn't know I exist and I just listen to him. We don't know each other at all. If these two worlds work perfectly together, we are very lucky. It is very exciting as well, this sort of synchronicity. If I make this music and someone has made a film for his music, you have two worlds meeting together at the same point. YOU STUDIED UNDER STOCKHAUSEN. WHAT KIND OF INFLUENCE WAS HE ON YOU? I'd like to know myself as he is a very powerful character. He is one of the last classical composers from the traditional side. He is writing music into scores but not performing it or he is performing it with electronic music. At that time when I studied with him, he was the church in the village. Everything, all the houses were built around this church. For me, he has nothing to do with rock music or pop music. But that doesn't matter to me. I came along with him and his music. It is my pleasure to look into different kinds of music and enjoy that. WHAT OTHER KIND OF MUSIC INFLUENCED YOU WHEN YOU WERE YOUNG? I was first thinking of becoming a composer when I was a child. To a child, a composer is the manager of all of the music. He must create it. Then I went to a music school and they said 'you must be a wonder child and you must be finished by fifteen.' I was a year too late! So I thought 'OK, you can become a jazz musician now.' I played guitar in a band in 1958 (Holger Schuering Jazz Band) and went to a Jazz Music festival. We had to play in front of a jury and an audience. One of the judges said to us 'It's impossible for us to classify what you played but never mind. I'll take you on a radio show as something that can't be classified.' I was very proud of this fact because I didn't pass my A-level degree at school, in music I got the worst grade. But the next day I had my first performance on a radio show! It was wonderful. Then I thought 'I'm not a born jazz musician.' It wasn't my world. So who remained? It was only Stockhausen. He was the most fascinating figure. He invited all of these other composers like John Cage to come to Berlin to perform (winter, 1962). They were doing performances and speaking to people about their ideas. John Cage was incredible. It was a concentration of these world composers for a few monthes. I had an incredible impression about what these people were doing. I moved to Berlin because I wanted to study classical music and the fact that he (Stockhausen) took me on after high school was a miracle. The Iron Wall was just established and I was looking for a flat. The cheapest flat was in a island that belonged to West Berlin but was in East Germany. You go to a corridor with petrol from the East Germans and you had to have a special visa. Inside on this island, I was guarded by three G.I.'s. Outside, I was protected by the East Germans. I just living with this barbed wire fence five meters away. It was great! It was fantasic! One day, I took my bicycle along the fence and saw these two East German soliders standing in front on the other side and watching two G.I. 's- one was white and one was a black guy, very tall. They faced each other wordless. Then this black guy took out these big mirror glasses and one of the East German guys just lost his face and disappeared when he saw this. Then the next miracle happened. It was 1962. General Clay was the commander of American forces in West Berlin. He flew in with a helicopter. I saw him as I was riding my bicycle. He came out and said 'come on, I'm inviting you for our greatest holiday, Thanksgiving.' He was wonderful. The mayor came as well. He served turkey and for the first time in my life I got drunk. It was incredible. I had to pass the check-points of the East Germans. The guards were especially selected because they able to escape into West Berlin. One third was assholes, one third was in between and one third was in between, as usual. I brought them some stockings for their wifes and something to drink. They liked me because of my car. It had holes in it and looked like someone was shooting at it with a machine gun. Three of the East German soldiers, I brought them with all of their weapons to the West Berlin check-point. The police there brought out some bottles of beer and we all drank. This was during this hot time (in the Cold War). Somehow I survived. What did Frank Sinatra sing? 'I did it my way.' So this is how I came to Stockhausen. I actually met Stockhausen at the end of the fifties. Somehow he had invented electronic music. What I heard was so.... that I thought of flushing toilets in outer space. I was somehow effected. I really couldn't stop laughing because it was so new to me. One person in the audience said to him 'Hey, you do these weird sounds just to give us a shock and out of this shock you want to make a lot of money.' He said 'I can promise you that I do this only for musical reasons. I have just married a rich woman- I don't need the money.' I thought 'This man is right of you. You must get in contact with him.' The heckler caught up with him after the show and said 'Now we can talk frankly to each other. Was that true?' So Stockhausen said to his wife 'Hey Doris, come here. He doesn't believe I'm married to a rich woman.' I thought 'you must look for a rich woman too.' Then I studied with him. I really went out to look for a rich woman. So where do you find that? In Switzerland. There were these private schools for daughters of rich families and I tried to become a teacher around Lake Geneva. It happened that they took me on. I found a very rich girl there and I was paid so high that I forgot about the rest! With this money, I saved a little bit and that was the beginning of Can. I wanted to make for one year holidays. So I thought 'Let's see what's going on in the world otherwise.' That's how Can was established. With this money, I bought a tape recorder and with this tape recorder, we made our first album. SO HOW DID YOU MET UP WITH MICHAEL, IRMIN AND JAKI TO FORM THE BAND? Michael was a pupil of mine. Irmin was a fellow student with me with Stockhausen. The rest was just the fact that Irmin knew Jaki. We were going to establish a new band that was somehow extraordinary and he asked Jaki to look out for a drummer and the next day Jaki came himself. Karoli left the school when I left the school. He studied in Switzerland and I got another job in Northern Germany. We were somehow always connected. So Irmin said to me 'Come on, let's form a band.' I said 'I have a guitar player, Karoli. I'll bring him with me.' This is how we got together. Then Malcolm Mooney came over from an exhibition in Paris. He just came by and just on holidays and didn't think of singing at all. He participated in the whole thing and Can was there. WHEN YOU STARTED THE BAND, DID YOU HAVE ANY IDEAS ABOUT WHAT DIRECTION YOU WANTED TO TAKE? We didn't even know if we wanted to become rock-orientated or rhythm-orientated or what. It happened that there was an exhibition in a little castle in Cologne. All the gallery people made a big party there and there was a Picasso exhibition. We played there for the first time. We had never all met and had never practiced but we played there for the first time. That became somehow very exciting. Wild and sometimes unorganized but at least exciting. Then we though 'maybe we should go into a rock direction- this is a good idea.' So we did it. EVENTUALLY, A STUDIO WAS BUILT IN THE CASTLE, SCHLOSS NORVENICH. DID THAT HELP THE BAND WITH CREATING MUSIC OR WITH GIVING YOU MORE FREEDOM? Yes, this is what I was talking about. As we didn't have any money at the time, we were sponsered by the man who rented this castle. He gave us a room and in this room we established a studio with the most simple equipment you can imagine and went on recording straight away. WITH THE CAN RECORDS, YOU ENGINEERED AND EDITED THE MUSIC. HAD YOU BEEN DOING THIS BEFORE WITH YOUR OWN MUSIC? What I had done as a pupil, I was working in a radio and television shop to repair equipment. I was interested in electronics so I learned everything there. I made a little side money to put away for myself, just five dollars a week. When we designed our studio, I just picked up the whole logic about that and we were able to do that without an engineer. We are very proud of that. HOW DID THE SONGS COME TOGETHER WITH THE GROUP? WERE THEY LONG JAMS THAT YOU EDITTED? Yes but the editing was really a minor step. It was not so extensive as it is today. All of Can's music was live recordings, played in this castle. HOW WERE THINGS DIFFERENT WHEN MALCOLM LEFT? HE MUST HAVE THOUGHT YOU WERE NUTS. Yeah, he said 'you're crazy!' So I went to him (Damo) and said 'We have a concert tonight in front of 5000 people. You want to sing?' He said 'Yeah, I have nothing else to do.' He did it. When he first started, without practicing or rehearsing, he was a calm and silent samuri. Like Japanese meditation. Suddenly, he became a very furious and wild warrior. Then all the audience left and disappeared. It was one of the wildest concerts I remember. But some people were left, about 30 Americans. And among these people was (actor) David Niven. He must have been fascinated by this whole thing. Only a very few people stayed there in this big hall. Most of the Americans were based in Munich. HOW DID THE BAND BECOME DIFFERENT WHEN YOU WERE WORKING WITH DAMO? I think it was logical that think would change because we learned by that time. We learned to get along with our equipment much better. We knew how to produce the music until we started using a multi-track machine. Up to that point, we had been using a (2-track) stereo machine without mixing, without these multi-track facilties. I would take the tapes home at night and I would be editting a little bit. THIS IS A QUOTE FROM JAKI: 'WHEN WE BEGAN IT WAS GREAT, EVERYBODY JUST HAD A FEW NOTES HE COULD PLAY SO IT STAYED SIMPLE. BUT OUR TECHINICAL ABILITIES INCREASED. HOLGER COULD PLAY BASS VERY FAST. IT BEGAN WITH TAGO MAGO AND IT REALLY WENT OFF WITH FUTURE DAYS. I THINK IT BECAME TOO SYMPHONIC.' WOULD YOU AGREE WITH THAT? At the moment when we got the multi-track machine, 'now we can find out who makes these mistakes.' This person now got so afraid that they'd say 'OK, I want to record my things alone.' It was natural but this was the end of the group. It took some other years and Can still made some very good albums after that. The fact is that somehow there remains this point that if you get out of this common responsibility, something is going to get changed. When I was first working alone, of course I was working with multi-track machines in the beginning. Then the digital devices came out. I immediately stopped multi-tracking recording. All the albums like MOVING PICTURES are not multi-track recordings at all. I don't mix these days anymore. Can you imagine that? Really high produced music without mixing. The digital technique pushed me back 30 years into the sixties, before multi-track machines came into existance. At that time, the engineers had to immediately mix things, to make decisions on the sound and recorded then straight away. This is what I'm doing now. In the beginning I bought a digital machine, the Akai DD 1000. I found immediately out that this is an incredible device. You can do endless multi-tracking somehow but the tracks you couldn't hear together so they became virtual. Then I got I went to the Akai company and said 'hey, do you want to waste money?' I told them about how I had sent them my product and how they send me their machine. They were surprised about what I could really do with that. This remains until today. I'm very happy that even when I'm working alone I'm not relying on multi-track machines. I still have everything completely under control but the decisions of sound and the vision to follow my vision, this is full in action. In the beginning when I record something this will be the point that this will somehow be the sound of the final thing. TOWARDS THE END OF CAN, YOU WEREN'T PLAYING BASS BUT WORKING ON TAPES AND SOUND EFFECTS INSTEAD. HOW WERE THINGS CHANGING FOR THE BAND? Suddenly, Can tried more or less to become more commercial. This was based on the idea that a few people should be able to play their instruments perfectly right. Jaki thought especially that we needed a different sort of bass player so we got a black bass player (Rosco Gee). And I had to look out for another instrument. I said 'With Can, we got a problem. The musicians don't really listen to each other very much.' I thought that it happens because nothing from the outside is coming in. I looked for the devices to bring a different world into the group again and they had to react on that. That was the idea, working with a radio or working with tapes or working with a telephone. I even had this idea that with a transmitter, we could transmit and receive things back again. Or to call up people like today's radio shows where people call up or you call people. This sort of interaction I wanted to establish. But the group was not interested in this. So I finished with Can and went my own way. And here, I really followed this. I was working on that for a few years (with Can) but then I found it that it wasn't fun anymore. I continued alone then worked with other people. WHERE YOU SURPRISED WHEN THE PUNK MOVEMENT CAME ALONG AND PEOPLE LIKE JOHNNY LYDON AND THE BUZZCOCKS SAID THEY WERE BIG FANS OF CAN? I was more than surprised actually. I remember that in England I met Jah Wobble, of Public Image at that time, who had a six pack of beer. I didn't know what to think of him at the time but he said 'come on, I've booked a studio in Soho somewhere.' We recorded our first piece 'How Much Are They.' It was in a cellar of a chinese restaurant. Someone came in, it was two American girls who thought that this was a part of the restaurant. The engineer had an intercom microphone on to record this conversation. They were asking us these questions like 'how much are they?' This is the kind of interaction I like. When it comes up to this point with these spontaneous things, I think you're lucky when this happens. I should kiss the feet of these two girls. A LOT HAS BEEN MADE OF THE WHOLE 'KRAUTROCK' PHENOMENON IN THE SEVENTIES. DO YOU THINK THAT CAN WAS PART OF THIS MOVEMENT OR WERE YOU ON YOUR OWN? I thought we were on our own. Faust didn't convince me that the time. I thought they were too intellectual and I missed the rhythm section. Can was very concentrated on getting along with genuine rhythms because of Jaki. Jaki was a very good drummer. He was a very good teacher for us. I must say that he really brought us to the point that we could really become a good band. When we played too many unnecessary things, there were too many ornaments in the music and they're not necessary. He took a lot of care that this didn't happen. But with the other bands, I thought first of all they were not that genuine from the rhythm point. They really didn't start from the very beginning. If you want to make something new, you shouldn't think too far outside. If you think 'I've reached a point and I have to think of something more' then you reach another point and you have to forget everything and start from the very beginning again. That means that you have to count until four, like that. And forget really everything. Like Amon Duul at that time, their heros were the Grateful Dead, by their philosophy and their ideas and everything like that. They played a little bit like this and this didn't convince me personally. I must say that I liked the people of Amon Duul a lot. They were very nice people. With Faust, I didn't have any connection. The fact that they worked with different medias was something that interested me. The whole multi-media idea was quite good but I was looking for the music. Where was it? What happened was, we made several tours through England and suddenly it came up that the British press was aware of several of the other German bands and called it 'krautrock.' I asked an Englishmen 'how can I understand this? What does kraut mean? Is it something positive or negative?' That was a good question because it was something in between. It was not something negative or positive. Maybe 'krauts' come from the Second World War. What was happening in England was that we weren't reguarded as 'krauts' anymore. We were more or less naturalized into England. How this happened was a miracle. We were Germans but we came there several times. The English audience felt that this was something new for them as well. I think it meant to be a good band, to play spontaneous, you must end up in a punk version somehow. You must be delighted about the trash idea. This is what happened here in New York when we played yesterday. SO YOU THINK OF CAN AS AN ORIGINATOR OF THE PUNK STYLE? Punk, what is punk? It's kicked-out people who had bad parents and never took care of the kids. They went out with their elbows (slam dancing) and tried to make their own way. I can very much understand this. This is happening with this underground electronic scene now. They're exactly the same people. But somehow they are the best people you can work with. I don't know why. OTHER THAN WITH STYLE, WITH THE MUSICAL SIMPLICITY THAT CAN WAS DOING, DO YOU THINK THERE WAS A COMMON THREAD THAT LEAD TO THESE PUNK BANDS, USING A MINIMAL APPROACH? I could imagine that. Maybe. The minimalization was something that maybe Can had something to do with. Actually, this was the fruit of their own efforts. Me personally, I was fascinated by the idea that we could minimalize something. That was the greatest idea. That was a philosphy that I could really follow. Think small. I liked that idea. WHAT KIND OF PLANS DO YOU HAVE AFTER THIS TOUR OF THE STATES? I'm producing five CD's. One of the artists will be U-She. One CD will be cover versions and the other will be old material as well. I made another piece called "La Luna" that is 45 minutes long like a gamelean orchestra session on a very electronic basis. U-She said it's the best that I've ever done in my life. Another musician from Los Angeles heard it and loved it also. I also have an album with Dr. Walker that is finished. The grand scheme would be the live idea because I haven't played live for 20 years and I've suddenly started concentrating on that and found out how we can record this. Interactive things maybe, if people came to me to do concerts for the internet. That interests me as well. 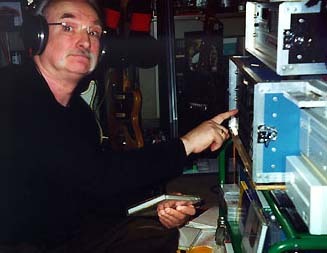 Also see Holger's own 'Short History of the Can- Disography' and his article on Stockhausen and Holger's official site.